Equities rounded out last week with another push higher continuing its impressive run of several consecutive weeks of gains. With markets closed yesterday in observance of President’s Day, today equities are kicking off this week entirely overbought. 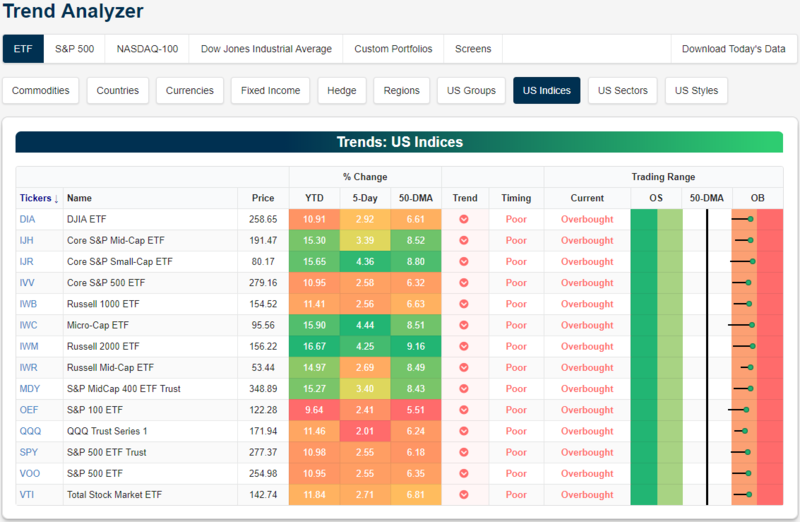 Of the 14 index ETFs in our Trend Analyzer, all of them are extended well into overbought territory. While not quite at extreme levels (the darker red area of the tool) yet, the indices have inched increasingly closer to there. They have also pushed higher essentially in tandem; none of the indices are drastically more or less overbought than the others. Though as they have been the better performing indices so far this year, small and mid caps are in fact all the furthest above their 50-DMAs. Small caps specifically have seen solid upward movement in the past week (gaining over 4% each) leading them to be the group that is the furthest above the 50-day. Conversely, large caps are still underperforming, but by a smaller margin than they had been.